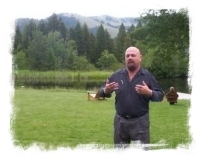 Robert Bruce life workshops are spiritually transformative events. They contain a unique component that can only be called Dynamic. Group work involves not only teaching but significant hands-on work and problem solving. Online workshops are also available through The Hall of Learning Attending one of our online workshops is just like attending a live workshop, only better. Better, because you can attend video classes when it suits you, replay as necessary, and our private interactive forums and chat facilities ensure you have the best advice possible.